Our Personalized Beer Glasses are a must have for your home bar. Personalize them to match your bar's theme (hunting, fishing, sports, tiki), your personal style (rustic, modern, classy) or even your family name, initial or monogram. These 16 oz gently tapered glasses features a timeless silhouette, easy style and thick weighted base, which make them a pleasure to hold. They end up being the most versatile glass in your bar, because not only can you serve different varieties of beer in them, you can also serve cocktails in them. They are also durable, stack-able and easy to clean. 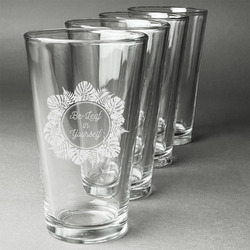 Sets of 4 beer glasses that will be custom engraved with your design. Each glass holds 16 oz and measure 5.75"H x 4.5"W.
You can have all 4 of your glasses engraved with the same design or you can customize and personalize each glass individually - the choice is yours!! The YouCustomizeIt customization system makes it really easy for you to customize one or our designs to suit your needs or to design your own beer glass. We have a huge collection of fonts and graphics for you to choose from. Enjoy! Let us know if we can assist you in any way.